Thanks to console accessories manufacturer Hori, the Nintendo 3DS and Nintendo 3DS XL are about to get even bigger in Japan. To celebrate the upcoming release of Monster Hunter 4 Ultimate Hori is releasing the Extended Slide Pad Controller, a grip controller-style accessory that places a second circle pad on the left shoulder of the Nintendo 3DS or Nintendo 3DS XL console, instead of along the right edge as seen on Nintendo's own Circle Pad Pro. The Extended Slide Pad moves the ZL button to underneath the left-hand-side grip. This new placement of the second circle pad will allow Monster Hunter players to move and control the camera entirely with the left hand, finally opening Nintendo fans to a gentler method of "clawing" or the "finger hook technique." "Clawing," long known to PSP-playing monster hunters, looks somewhat awkward and cramp-inducing. Hori is also planning to release a Monster Hunter 4 Ultimate accessory kit including a cleaning cloth, stylus, carrying strap, and a decal; none of which are threatening to make the 3DS appreciably larger than stock dimensions. Are you dying to get your hands on the Extended Slide Pad, or are your hands dying at the thought? Let us know in the comments! We can move the camera with the buttons instead of a 2nd circle pad? Sure why not? The second circle pad placement looks awkward, but this will be get used to. I'll just keep my CPP then upgrade to a CPPXL when I get an XL. Please release this thing in the US as a Stand Alone Product. this looks awesome! it's so weird!!!! I'd love to get one! Interesting new attachments! I'd like to try them, though if we don't get them i won't complain. I'm like a fish in water without it. @Knuckles Thanks! I've been a member for a few years and writing for Nintendo Life for a few weeks, now. I'm horribly dependent on my CPP XL but whenever my friends and I get together and hunt I'm on the Wii U using the Game Pad. Being ranged, I tend to get the most entertaining victory pictures. I am quite happy with the Circle Pad Pro as it is. Like the look of the grip though. (With I could just get one without another circle pad pro). Umm, no thanks. I'll stick with what I have. I've been looking for a grip/circle pad combo. This looks a bit akward, but might work just fine. I'll look into when MH4U gets a releasedate. Why does no one come up with the idea of a slim back case that adds 2 shoulder buttons and a flat, slim slideover atachment for the circle pad, that fills the space beneath the face buttons ? To close the system, simply unslide the CP and put it on the back of the case. But to be honest, the CPP(XL) is good the way it is, and i really love the added weight and grip. Looks.... interesting? But I'll stick to my CPP. Worked just fine with 3U, and this game won't have underwater battles, making it even easier to control. I like the idea of having the second stick there actually, I can see it being easy to reach and it leaves your thumb free for the buttons. Do I break off the arm and use super glue to get this to work on my 2DS? I'll...reserve The Claw for when I play God Eater Burst on my PSPs. For 3DS, I'll just stick to touchscreen or my CPP that I never use. That is probably one of the most uncomfortably looking console accessories that I've ever seen... Would play the game though. Weird. I wonder what impact it could have on gameplay? Nice, this looks way better than the CPP to me, I'm far more interested in this, will have to pick it up. I have a better fix. Release it for the Wii U! This looks more convenient than using the CPP, actually. It leaves your rght thumb open for the face buttons and it works particularly well for this game since it's in basically the same spot as the L button you're replacing. So camera movement is still around the L button area which is good! And it's not the eyesore the CPP is. @Hy8ogen I support this fix. The touchscreen camera works fine; you don't need this. While the touch screen did indeed work very well, I'm actually intrigued by the idea of having the second stick in the same hand... I wonder how that would work in any other game genre, like an FPS? Does Moon Chronicles support second analog? Worst position for an analog stick I have ever seen. Some games simply cannot be played this way. Why not just make a regular CPP with handles and a MH4U themed skin? 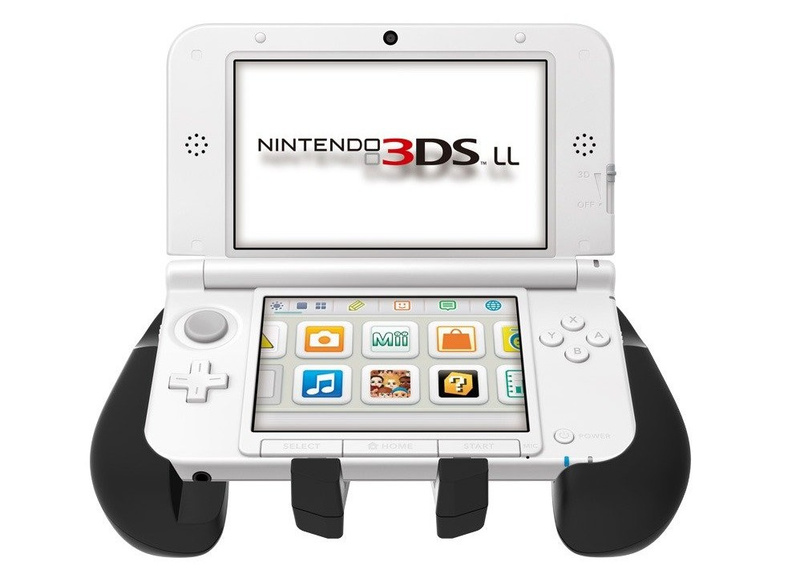 I am actually hoping the final 3DS model has dual circle pads and the extra shoulder buttons. That would make me happy. The touchscreen camera is really amazing, played 400 hours with that but I did eventually succumb and got the CPP XL and it made me even more awesome (Better than the touchscreen mainly underwater). This in my opinion looks more appealing from the front but the position of the Circle Pad is awful. I think I will stick to touchscreen/CPP XL that I actually use! This looks freakin' awesome. I think its pretty darn genius. @pigwarts5ever so it's not just me who finds that awesome!! @GuSolarFlare Not even a little bit. It looks so convenient. I've never even played a monster hunter game but I might just so I could use this (unless they sell it separately). people have been modding their CPP like this since monster hunter 3's release in Japan. Its awesome to see this, the grips also look like they'll improve the comfortability of the 3DS, which normally digs into my hands. 3DS Pro... you and I are on the EXACT SAME PAGE. Enough with the accessories (although with this latest one, I'm glad this thing allows the 3DS to remain symmetric this time, though why not put the circle pad on the right side?). It's time for the 3DS to come built with a second circle pad. C'mon Nintendo, if you can give the Gamepad 2 sticks, give the next inevitable iteration of the 3DS 2 circle pads. Just release the game on Wii U too that has a proper controller already! At first when I looked at it, I thought the 2nd circle pad was a button. Till I finally realized. It's actually a great idea! It's finally a decent challenger for the claw. The claw was by far the best option for MH games because you could roll to a direction and change the camera at the same time. It was even better for bows, because you could charge, walk and turn the camera all at once. I'll probably not buy it, though. I like the freedom of carrying only my 3DS. @Maggots I'm in for a 3DS Pro. Its actually a little late for this kind of upgrade. So now would be a good time. @yuwarite you don't need it at all, but its nice to have alternatives to the touch screen camera, and now we have two, the official CPP, and this, and I think this looks fantastic. I'm seriously considering getting it, might get RE: Revelations another playthrough with the thing. I'll...just use the Circle Pad Pro... I haven't used mine since I got MH3U on the 3DS...and I had to sell it for reasons known to some of the forum members. I wonder how much it's gonna be in the US? This is pretty obscure. can't be TOO uncomfortable though, at least until after the initial stiffness. My poor, cramping hands are begging for this accessory. Psh, I don't think I'll be buying this, no. I have been looking into getting a grip for my XL due to my hands still cramping up during Mario Kart 7 and the only thing keeping me from it is pretty much every grip I have found has made it a pain to use the stylus as the design for the grips tends to cover it for some reason. The 2nd circle pad looks useless from where they put it, and if it's to attain for previous PSP players, I can see why I don't like it as the PSP always felt like trash in my hands. The Vita fixes this, but there's literally no games on Vita that I want besides maybe Earth Defense Force. Nice of them to get my hopes up for a useful grip, though. It looks interesting enough to try but my main handheld is a 2DS so I wont be able to use it. That wedge design is just so damn comfortable while playing. I still have a 3DSXL but rarely play it since the clamshell design kinda adds strain to my thumbs. Why can't we just get a regular 3DSXL Circle Pad Pro? I know that it's available on Nintendo's website, but I heard bad things about it, and I just want to buy one from the local GameStop.